I think dating sims and cliche high school games that aren’t anything like my real experience are exceptionally fun, so it’s no surprise that I’d be interested in Hatoful Boyfriend. You play a young woman who goes to school, manages her time, and goes on dates. You’re also “the last human girl in the world.” I’m not sure if you’re the last human or just human girl, but either way, you apparently decide to start dating birds. Of course. It’s a PC and Mac game aiming at a release this summer. Assuming it’s cheap enough, I’m pretty much sold. 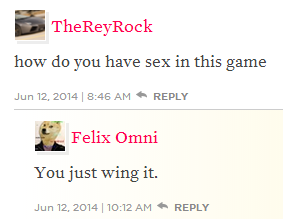 – Bird dating sim Hatoful Boyfriend is a bizarre delight, Megan Farokhmanesh, Polygon, 6/12/14. It seemed like Nintendo announced new entries in most of their franchises. Many of them looked pretty great. Hopefully it’ll be enough to substantially increase their install base. I suppose I’ll talk about the games for which I’m least excited first. I didn’t put a ton of thought into the order besides wanting to end on high notes. Super Smash Bros. is still coming out. It’s not one of my favorites, so I don’t have a lot to say. I’m sure I’ll play it and enjoy it, but Smash is usually a game I play a bunch for a day or two and then leave. Creating custom fighters with miis could be interesting. Nintendo has figures called amiibos that work like the Skylanders toys. I’m really not sold on this idea. Okay, they can into my game, but can’t I already bring things into games using, I don’t know, DLC, without having to store a bunch of figures? They mentioned that as an amiibo fights in Smash, it’ll get better, and I could then bring it a friend’s house. Again, I feel like you could just save this to an account. Now, I’m not against figurines. If they’re really cool, that’s great, but it seems needless. A new Star Fox is being designed by Miyamoto. I was shocked that the Wii didn’t have a Star Fox or a Pilotwings, so I’m glad to see a new Star Fox coming to the Wii U. I’m not clear on how it controls, but it requires you to watch the TV, which displays what looks to be a familiar view for a Star Fox game, as well as the gamepad, which is used for aiming and shooting. I don’t know. That sounds terrible. Miyamoto is also designing Project Giant Robot, which also uses the TV and gamepad. The TV gives you a larger view of what’s happening while the gamepad has a first-person perspective. You control a giant, slow-moving robot. The sticks control the arms while tilting the gamepad controls the robot’s balance. It was compared to sumo wrestling. I’m more open to this than the controls of Star Fox. His third game is Project Guard in which players control security cameras defending a base. The TV displays feeds from all the security cameras while the gamepad shows a map. You use both to see enemies approaching your base and to plan your defense. Link’s going to do some running around on the Wii U in a new Zelda game soon that’s supposedly going to be much more open and focus on exploring. That’s good and bad. I liked going into side dungeons back in A Link to the Past to find better weapons to help. It was nice being able to obtain some at any time. On the other hand, sometimes if I spend too much time playing around in an open game without making progress, I feel demoralized. I’ve also been annoyed at the increasing long tutorials in Zelda games. I hope we get started quickly and that Link gets his sword within the first two minutes. It does look really beautiful! I’m not sold on it yet, but I do really love the Zelda universe. A new Kirby game is coming as the successor to Kirby’s Canvas Curse called Kirby and the Rainbow Curse. At first I thought it said “Course” and was excited in the hopes that it was a sequel to Kirby’s Dream Course. Come on, Nintendo! I didn’t play Kirby’s Canvas Curse, so I don’t know what to expect here. Also, there are plenty of other Kirby games I missed that I could play cheaper (or already own) – Dream Land 2, Dream Land 3, 64, The Amazing Mirror, Epic Yarn, Mass Attack, Return to Dream Land, and Triple Deluxe. Yoshi’s Woolly World looks like a combination of a Yoshi game with Kirby’s Epic Yarn. It looks like a lot of fun, but it also reminded me that I didn’t play Kirby’s Epic Yawn. And then I realized that there was a recent Yoshi game, Yoshi’s New Island, with which I wasn’t familiar at all! Splatoon is an interesting third-person shooter that involves squids shooting ink. The goal is to cover the map with your color, and the ink they shoot has consequences in the game. You move faster through your own ink (and refill your ink), and you move slowly through the opposing squids’ ink. It looks like it could be fun. Last night I was playing Super Mario 3D World, and as I played a toad level, I realized that they’re a lot of fun and wondered if Nintendo would ever release a game based on it. Apparently they would, and it’s going to be called Captain Toad: Treasure Tracker. I can only imagine it’ll be fun because I love the puzzles in Super Mario 3D World. Speaking of puzzle games, a new Mario vs. Donkey Kong game was announced for the Wii U. I played and loved the first two, but this announcement did make me realize that I missed the last three titles in this series. Mario Maker is the game that makes me giddy. Mario Maker is to Mario levels as Mario Paint is to pictures and music. As far as I could tell, there was no information released on sharing your levels. I really hope I can share them online with my friends. It looks like a blast. Before I jump back into Nintendo, I should also mention that a feature-length Sonic the Hedgehog movie was announced blending animation with live-action. I bet it’ll be terrible, and I’ll definitely enjoy watching it! As for Nintendo, they had a very strong showing, but there’s still a problem. I’m not sure how many of these I’m going to purchase. I hope that they get strong sales, because I want Nintendo to succeed. When I have so many games that I own and haven’t finished, I shouldn’t be buying new games. Some of these games would be ones I’d be super excited to play except for the fact that they reminded me that I’ve already missed entries in their series I could play cheaper. I have Kirby’s Dream Collection and Kirby’s Epic Yarn, for example. There are also similar platformers I missed such as Donkey Kong Country Returns and Tropical Freeze (or non-Nintendo series such as Epic Mickey and its sequel). I would have been interested in purchasing Star Fox if it wasn’t for that control scheme. It might not be so bad, but I’ll need to wait and see. Considering that Mario Kart is one of my favorite series and I’ve resisted buying Mario Kart 8 in an effort to save money and play what I own, I’m not sure I’ll be buying many of these. Mario Maker looks amazing, and I’ll probably be picking that up. If Captain Toad: Treasure Tracker is cheap enough, I could see getting that. (If it’s a retail release, I’ll likely pass.) That’s not to say that I’m not interesting in the others. Many of them I’ll likely play in the future, either picking them up cheap, borrowing them from friends, or possibly just caving to my cravings. This is all really a reflection of where I am with gaming and not their announcements, I suppose. I don’t think Nintendo could have had a stronger showing honestly. It’s not enough to simply release good games, because there isn’t enough time to play every good game. They have to be better than whatever else one would do with that free time. Let’s hope these announcements help Nintendo! It might be easiest if I make this a bulleted list. Some mainstream franchises that get sequels once a year will keep getting sequels. Hopefully tomorrow is more interesting to me.